The outstanding 888casino has geared-up an excellent live roulette promotion called the Daily Lucky 8. This promotion is running every day between 8 and 9pm GMT and this is where eligible players can win a $8 bonus every time the winning number turns out to be nr 8. Click here and visit 888casino right now and claim a £/€/$1,500 Welcome Deposit Bonus Package! So basically, if you’re betting on a round (minimum bet is $8) at the Live Casino Roulette table in the 888 Private Room and the ball ends up on nr 8 – you’ll be given a bonus of $8. You can use your bonus on any type of casino game but make sure to note that certain casino games contribute differently towards the bonus wagering requirements and this particular bonus is subject to a x30 wagering requirement. This promotion is subject to further terms & conditions, so make sure you read up on them before you play. Get up to £/€/$888 New Player Bonus – No Deposit Required on 888casino’s Registration Wheel! If you’re a resident of the UK, Germany, Sweden, Canada, Austria, Switzerland, Netherlands and Ireland you will be able to win up to £/€/$888 in FreePlay bonus money when you become a member of 888casino. As soon as you have registered your account you will be able to spin the Registration Wheel which will determine your FreePlay bonus. Terms and conditions apply! Click here and join 888casino today! 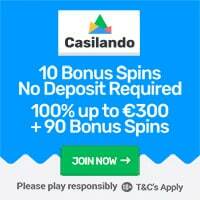 1st Deposit: Get 100% up to €100 Bonus (promocode: Welcome1)! All bonuses in this welcome bonus package are subject to a x30 bonus wagering requirement. Terms & conditions apply! Click here and visit 888casino enjoy some great online casino action! Please note that all content available on this website is suitable for adults that are +18 of age. Always read the terms and conditions available for each casino promotion before you start gambling!